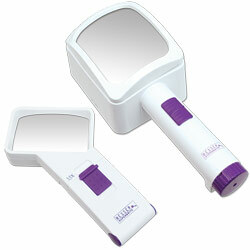 Combo kit: one 3.5x handheld and one 3x stand magnifier. Besser Superbrite Stand Magnifiers were designed to provide the brightest, clearest performance available in a stand magnifier. The extra bright long life LED's provide superior, even and consistent illumination across the entire field of view, giving the user the best possible viewing experience. The magnification power is printed on the frame of each magnifier for easy identification. Uses 3 AA batteries (not included.) 1-year limited warranty. Besser Superbrite Handheld Magnifiers were designed to provide the brightest, clearest performance available in a handheld magnifier. The extra bright long life LED's provide superior, even and consistent illumination across the entire field of view, giving the user the best possible viewing experience. The magnification power is printed on the frame of each magnifier for easy identification. Uses 3 AAA batteries (not included.) 1-year limited warranty.